United Apparel is a proud initial core participant in the groundbreaking TCF Council of Fiji’s accreditation programme. This programme saw many elite consultants from all over the world to assist and elevate participatory Council members. Upon the conclusion of the 3 year programme, an audit was performed by an international recognised, independent auditor. Firms that passed the audit are official ‘Make it in Fiji’ factories and can proudly display their accreditation and logo on all company collateral. The audit was ‘all encompassing’ and addressed Quality Assurance, ethical treatment of workers and a long list of categories within Social Compliance. It has been similarly performed worldwide by a seasoned auditor. 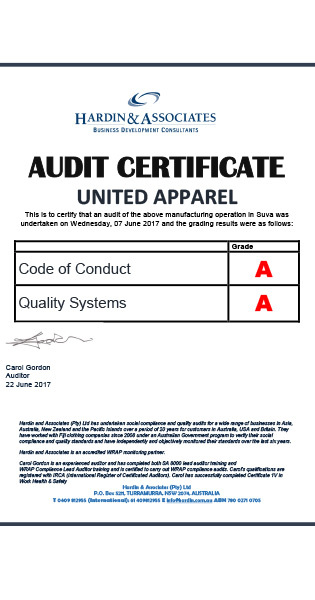 United Apparel received a remarkable ‘A’ rating, the best mark available and a standard few companies reach. In addition, United Apparel is also a Worldwide Responsible Accredited Production (WRAP) facility. WRAP is the world’s largest independent certification program that primarily focuses on the apparel, footwear and sewn product sectors. With our recent ‘Platinum’ designation, WRAP’s highest certification level, United Apparel is delighted to become the first company in Australasia to attain this accreditation. These significant achievements carry with it a strong message that United Apparel equally prioritizes our clients and our workers, and that we treat them both with the same ultra professional standard. It also indicates to our clients that United Apparel has the competitive edge, a factory committed to sustainability and accountability.